When I last wrote a post about U malé velryby (Little Whale), I told the story of my fun surprise birthday party there. We took over the little place that night and really enjoyed ourselves. We've been back several times since. 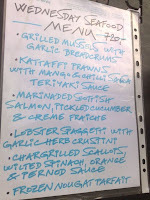 But we always missed the Wednesday seafood specials that Chef Jason was always telling us about. 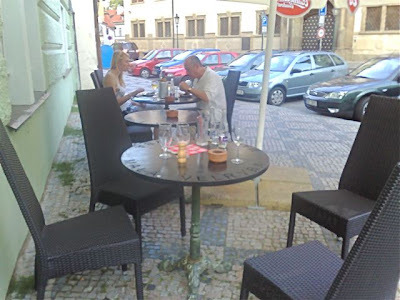 We grabbed a table outside on Maltézské náměstí. It's a peaceful square near the tourist center, not far from the Charles Bridge. We enjoyed sitting there on a warm summer evening after work. In fact, we even had some special entertainment. An opera singer was rehearsing "Carmen" next to an open window across the square from us. Outdoor diners on the square broke out into applause after she finished her song. The special seafood dishes were offered as a degustation menu with six items for 720 CZK. V ordered that. I mentioned that some of the food sounded good, but I didn't want to order the whole menu. I wasn't feeling so hungry. The chef was very flexible and said I could order anything à la carte. 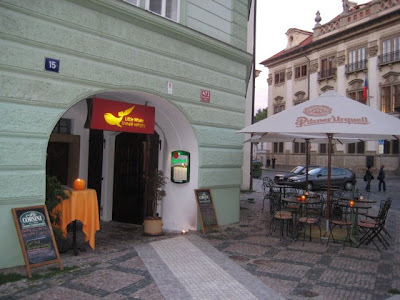 I had three dishes for just 350 CZK, but I did taste everything V had. 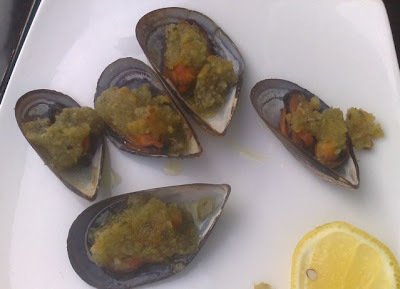 The first was grilled mussels with garlic bread crumbs. I was a little concerned that it was not exactly mussel season, but they were fine. The breadcrumbs were buttery, crunchy goodness. I could eat a bowl of just that stuff. Yum. 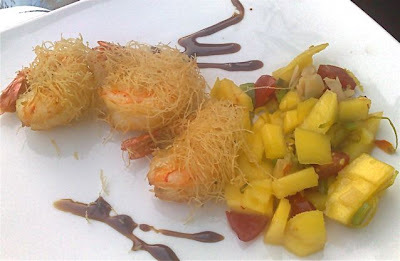 Next came prawns with a mango chili salad. This was my favorite. We'd made something similar at home, frying angel hair rice noodles around the shrimp. The mango, mixed with green onion, cherry tomatoes, and ginger, was a great match up. 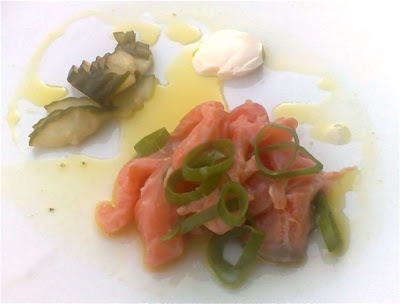 For a third course, there was marinated Scottish salmon with creme fraiche and pickled cucumber. This was fresh fish, cooked by the acid of lemon, along with some of the pickle juice. The pickles were a bit of an odd combination, but I still enjoyed it. Then, we had what was billed as the lobster spaghetti. The sauce had a significant amount of butter in it. But the chef had almost run out of lobster. 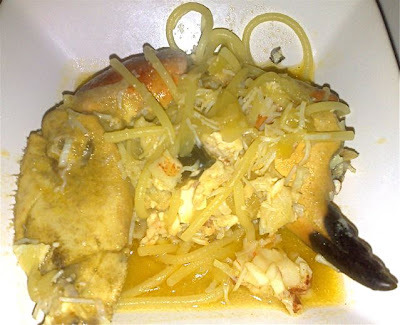 So, he put a little lobster meat in the dish, along with a whole crab claw. Very generous of him. The shells were cracked in the kitchen before they came to the table. Still, we had trouble getting all the meat out, so the chef brought out a big mallet for us to wield. I smashed those suckers open on the hard iron outdoor table. It was a noisy, messy scene, but we haven't had that much delicious fresh crab meat in a long time. 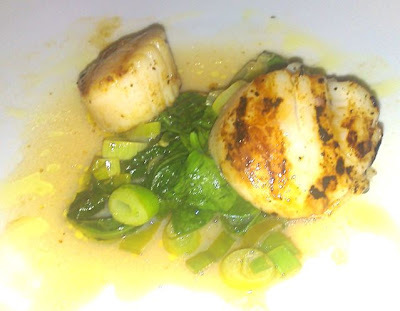 The fifth course was scallops over wilted spinach with orange and Pernod sauce. This was V's favorite. She says this restaurant makes the best scallops she's had in Prague. They are perfectly seared, with a hint of char from the grill, yet very lightly cooked, maintaining the most delicate texture. She also liked the greens it rested upon. For dessert, there was a frozen nougat parfait. Chef Jason described it as a semifreddo, something halfway between ice cream and a mousse. 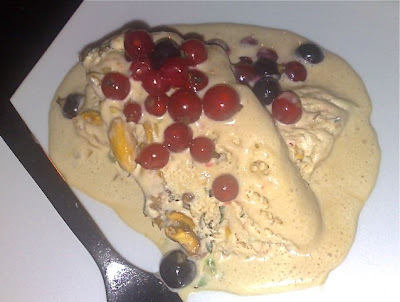 It was made with cream, egg yolks, sugar, walnuts, almonds, candied cherries, all whipped up with a shot of Cointreau. There were fresh-picked berries from a garden sprinkled on top. We loved it. Little Whale is not perfect -- it's had some issues with service and consistency in the past. But that appeared to be on the mend, based on our last visit. It was a very nice meal, very different from the usual fare, and like a good story, it was something I wouldn't mind repeating again. I attempted the "crispy roast duck, potato-herb stuffing, apricot sauce", but it was far beyond crispy. I do have some education in chemistry and I would postulate that the moisture content of the duck was app. 0.125% Upon not chewing the duck I made the staff aware that it was inedible. The response was, and I quote, "Yeah.. I saw it was a bit dry, but I don't know what happened to it." After which the server returned to the kitchen however the duck did not. Apart from that the crab soup was fine, my partner's fish and chips was lovely and Monseur Depardieu produces a fine vintage. EE.